The City of Berwyn will begin a pilot program in which online transactions through Berwyn’s website will no longer charge residents so-called “convenience fees.” Additionally, the City will finally accept all major credit cards for online payment to include Visa, MasterCard, Discover and American Express. The overdue move by the City, enacted to increase service delivery to residents and embrace a more proactive approach to government, will go into effect at the start of 2015. Cook County’s first Long Range Transportation. The City of Berwyn would like to announce that street name signs are available for purchase for $20.00 per sign. The street name signs are available in white background with black lettering or blue background with white lettering. Mayor Robert J. Lovero, Berwyn Township, Berwyn Health District, and Senior Services invites all Berwyn senior citizens to join us on Wednesday, December 3rd at the Skylite West Banquet Hall for the 2014 Senior Holiday Breakfast. The Skylite West is located at 7117 West Ogden Ave in Berwyn. Doors open at 8:30am / Buffet 9:00am. To reserve tickets call 708-484-2510. Must be 55 yrs or older. Click here for Rep. Ford's Daily Job Leads! Train Crossing Closure - Grove Ave. The train crossing at Grove Ave. in Berwyn will be closed starting October 31st 9:00a. through November 7th at 6:00p. During this time, traffic will be detoured to Home Ave. 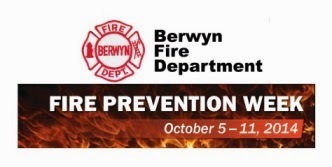 Please note that a “Special Meeting” may be called upon proper notice and pursuant to all Berwyn City Ordinance Requirements. 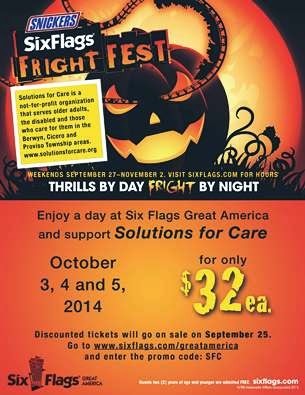 Support Solutions for Care and enjoy a day at Six Flags !